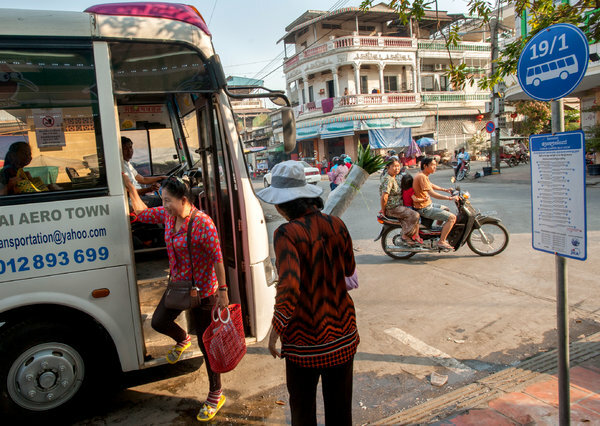 A Japanese-sponsored pilot project introduced a bus service to the chaotic streets of the capital of Cambodia. PHNOM PENH, Cambodia — This city of nearly two million people has many of the amenities of a modern metropolis — broadband Internet, automated teller machines and fancy restaurants, to name a few. But until this month, the capital of Cambodia had no public transportation system. To get around, residents had to inure themselves to perilous rides on motorcycle taxis or dust-smothered commutes in open three-wheeled tuk-tuks. Now, in an experiment underwritten by the Japanese government, Phnom Penh is giving the relatively alien concept of public city buses a try. Ten buses are making their way up and down Monivong Boulevard, one of the city’s main thoroughfares, for a month to see if they catch on with Cambodians. Since the buses began running Feb. 5, curious residents have been climbing aboard just for a test ride. Cambodia has plenty of private buses that ferry people across the countryside and connect provincial cities with the capital. But developing mass transit within Phnom Penh has until now ranked low on the priority list in a country where one-third of the population does not have running water. 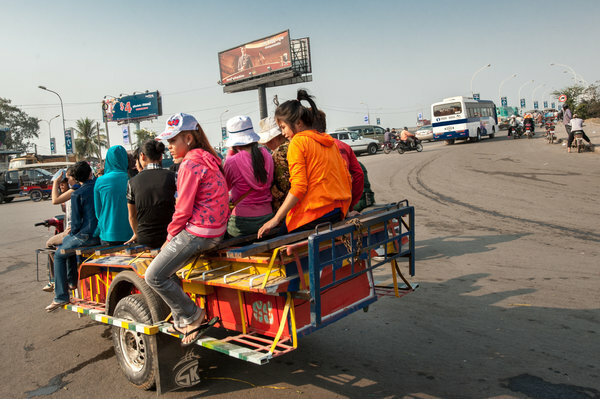 The genocidal rule of the Khmer Rouge, which ended in 1979, damaged the country’s social fabric so badly that Cambodians came to assume that in many facets of life, including transportation, they were mostly on their own. Some riders on the new Japanese-sponsored buses in the capital said that the lack of a public transportation system was emblematic of a country where government assistance was rare and civic-mindedness in short supply. Ms. Vannary lamented the unruliness she said she saw in the streets, where traffic laws are rarely enforced. She described Phnom Penh’s traffic as a free-for-all, comparing it to “children refusing to obey their parents,” and wondered whether the bus service would prove effective. An earlier experiment, sponsored by Japan in 2001, ended after several weeks. The new experiment, relying on rented buses and temporary staff, appears to have rapidly won admirers. The buses are often packed at rush hour, and a supervisor of the line says that about 3,000 people are using them daily. Ticket collectors wear shirts that say, “Take the bus for a better future of Phnom Penh.” And yet the immediate future of public transportation remains cloudy. The government has yet to set many of the specifics, including the starting date, for a permanent service that will follow if the one-month experiment is deemed a success. Mr. Egami, the Japanese agency’s representative, emphasizes the importance of low fares to lure customers. He said he doubted that a public transportation system could be run at a profit, at least in the early stages. “It will require a subsidy,” he said. That appeared to be at odds with the city government’s intentions. Long Dimanche, a spokesman for the Phnom Penh municipality, said that it had chosen a private company to run the buses and that “there will be no subsidy.” The contractor “has expertise,” Mr. Dimanche said, but he declined to identify the company. “If everything works out,” he said, a permanent service will begin this year. If it does, many city residents may need a quick primer on the ins and outs of bus riding. A woman hurried up to Mr. Sovanvisal, apologized for interrupting and asked what time her relative, who had boarded the bus on the other side of the city, would arrive at this end of the line.